The Edwards' home - Wash Common Post Office (closed 2005). Ellis Russell, known as Russell, was born in Winchester in 1889 shortly before his parents, Ellis John Edwards and his wife Elizabeth (née Dunning), moved to Wash Common, Newbury. He was the youngest six children, the fourth son. In Winchester Ellis had been working as a servant/butler; the move to Newbury was more than just a change of employer as Ellis had a total change of careeer to become a labourer and boiler maker. In 1898 or 1899 he had another change of job, taking the role of sub-postmaster (and caretaker and gardener). 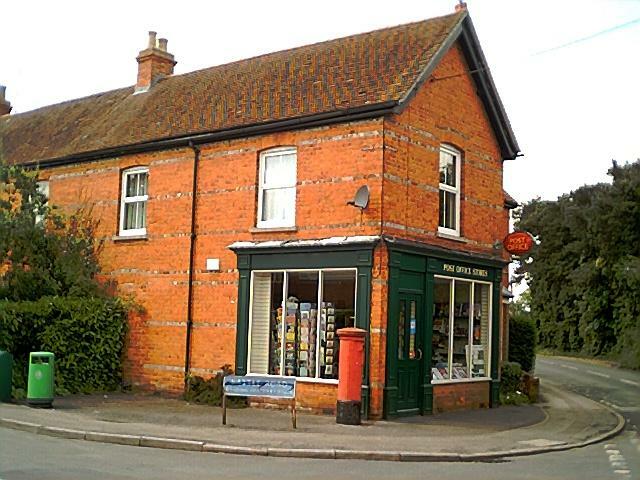 Prior to this the sub-post office at Wash Common was on the east side of the Andover Road between Monk’s Lane and Park Lane; when Ellis took over the job he established the new post office in his house, 1 Essex Street, on the corner of Battle Road. Russell was working as a postman when war arrived to disrupt so many lives. In February 1916 Russell joined the Wiltshire Regiment but was soon transferred to the 7th London Regiment, a territorial battalion (London Regiment battalions all took the name ‘regiment’ even though they were really only battalions of the overall regiment). His number was initially 8275 then changed to 354393 when the Territorial Battalions were renumbered in early 1917. He probably joined under the Derby Scheme, a precursor to full conscription named after the Minister for Recruitment, Lord Derby, who introduced a scheme that encouraged men to register for enlistment at a later date (as and when required). Final registration for the scheme was in December 1915 after which men were called up in batches dependent on age and marital status. As a single 24 year old Russell’s name would have come up in the first batches to be called up. His 37 year old brother, George, was called up the following month and was also sent to the 7th Londons. Following training the brothers were sent to France in October 1916, part of a draft of reinforcements to the 1st/7th London Regiment. On 4 July 1917 George was killed by a shellburst as the battalion withdrew from frontline duties. Russell had the dreadful task of letting his parents know the bad news, which he did before they were notified through official channels. On 20 November 1917 the British and Empire forces launched an offensive against the German defenses known as the Hindenburg Line; for the first time in history massed tanks, over 350 of them, supported the infantry attack. The offensive rolled over the German defenses in an unprecedented manner. As the tanks crested the ridge miles beyond the German lines they saw Cambrai lying virtually defenseless before them. A moment later they discovered that the Germans had given some thought to the problems posed by tanks - field guns firing horizontally smashed tank after tank as they rolled over the ridge. In all over 200 tanks were lost. Nevertheless the troops had advanced from 3 to 5 miles through strong German defenses in four hours, with the loss of only 4,000 men - an astounding result in comparison to previous offensves. As ever, the German response was to counter-attack, and things did not go so well for the Allies. On 30 November the Germans attacked three tired and depleted British divisions (59th, 47th & 2nd) with overwhelming force. Russell Edwards and the 1/7th London Regiment where with the 47th Division (140th Brigade). The 1/7th were not heavily hit by the initial attack, presumably they were in reserve at the time of the assault. However, this initial good fortune only meant that they were in good shape to spearhead a counterstrike. On 2 December the battalion, together with the 1/8th, regained much of the ground lost three days earlier - at a high cost, over 100 men from the 1/7th alone were lost to machine gun fire. Russell was one of the men who didn't answer roll call that night. The death is notified of Ellis Russell Edwards, of the London Regiment, youngest son of Mr and Mrs Ellis John Edwards, of Wash Common Post Office, aged 28. 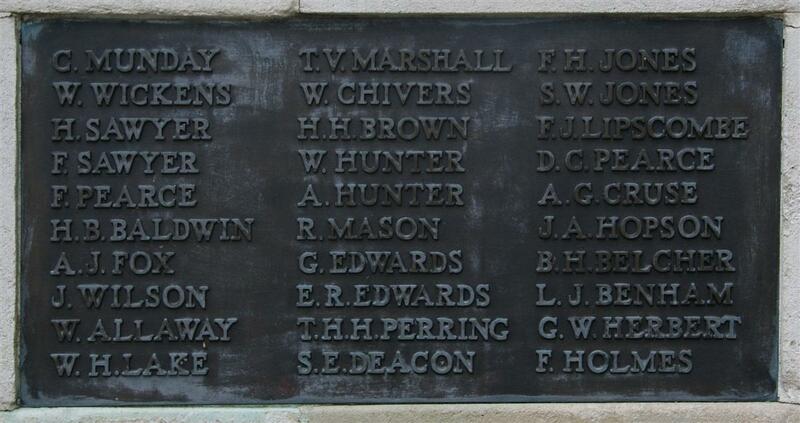 He was formerly a postman at Newbury, and was killed in action on December 2nd. He joined up in February, 1916, being sent to the Wilts Regt but transferred to a London battalion. Both brothers went to France together in October, 1916. George was killed in July 1917. 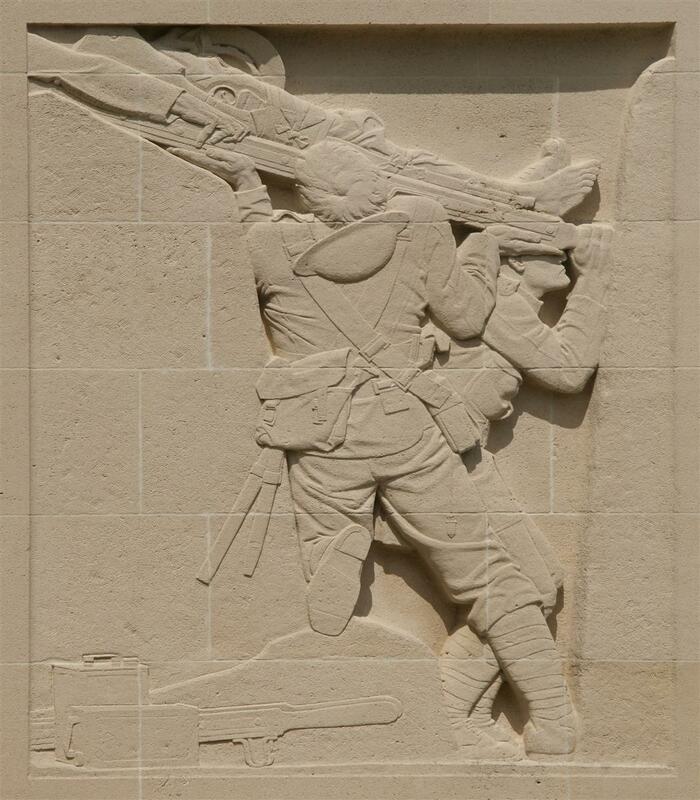 A bas-relief on the Cambrai Memorial, depicting a scene from the trenches. His body was not recovered in a recognisable state, perhaps it lies in one of the thousands of graves of unknown soldiers in the region. His name is remembered on the Cambrai Memorial outside Louveral, France. His name is recorded on panel 11. Russell is also remembered on his parents grave in Newtown Road Cemetery was well as on Panel 3 of the Newbury Town War Memorial and a memorial plaque in the entrance to Newbury Post Office. His brother George Edwards died a few months earlier in July 1917. Their parents lived on into the 1930s when they died at the ages of 87 (Elizabeth, 1931) and 88 (Ellis, 1934).